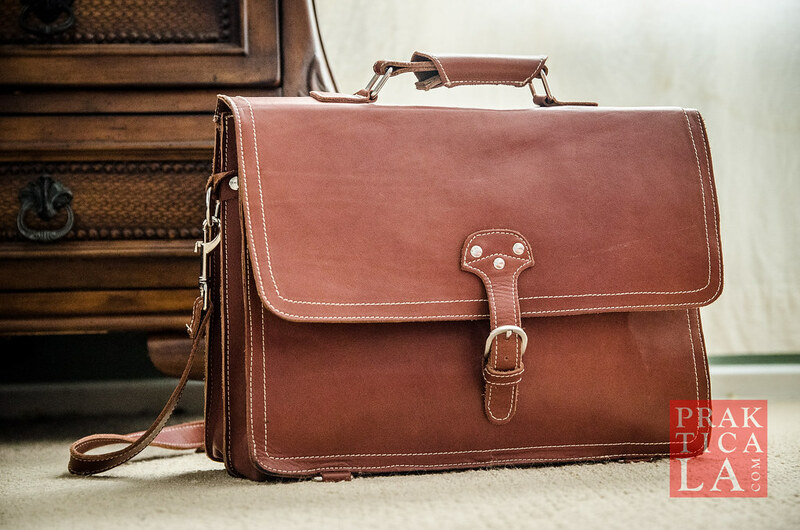 A few characteristics were important to me when selecting a briefcase for school/work. First, it should look masculine, i.e., I didn’t want a bag that looked anything like a purse. Duh. If you’re unsure of what that means, the easiest way to evaluate this is by using the James Bond test. If you can’t picture James Bond wearing/carrying it, then you shouldn’t either. Easy! Second, like anything else worth getting, it should last a lifetime. I’ve had plenty of “leather” briefcases in my day and they all eventually faced splitting, cracking, and fading in just the same way crappy shoes do. And, like shoes, shoddy briefcases not only function poorly but also reflect poorly on their owners as well. 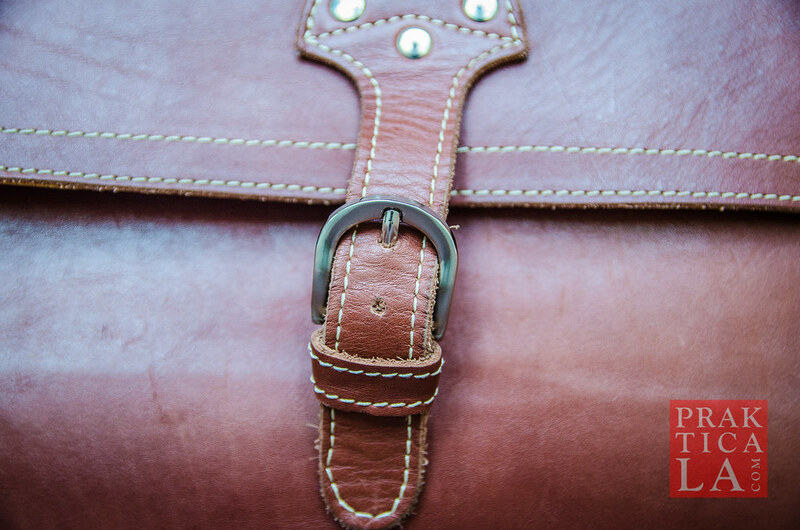 The leather on the Garein briefcase is indeed full-grain, and very thick. I don’t know if the leather is cut from the same stock as their shoes are, because it seems significantly thicker than the leather on the Bonucci oxfords. John Doe Shoes left the edges exposed so you can see the actual heft and grain of the leather, rather than folding in the edges – a technique often used to mask thin, cheap, and/or fake leather. And unlike substandard grades of leather like “genuine” or “top grain” and garbage like “bonded leather” and the laughable “vegan leather” (nothing more than cheap plastic that has been cleverly renamed by low-rent marketing professionals), full-grain leather will not only last a lifetime but will also look better with age! Additionally, the Garein briefcase is surprisingly soft and flexible. When opening and closing the flaps, the action seems natural, instead of feeling like you’re unfolding the stiff panels of a cardboard box. 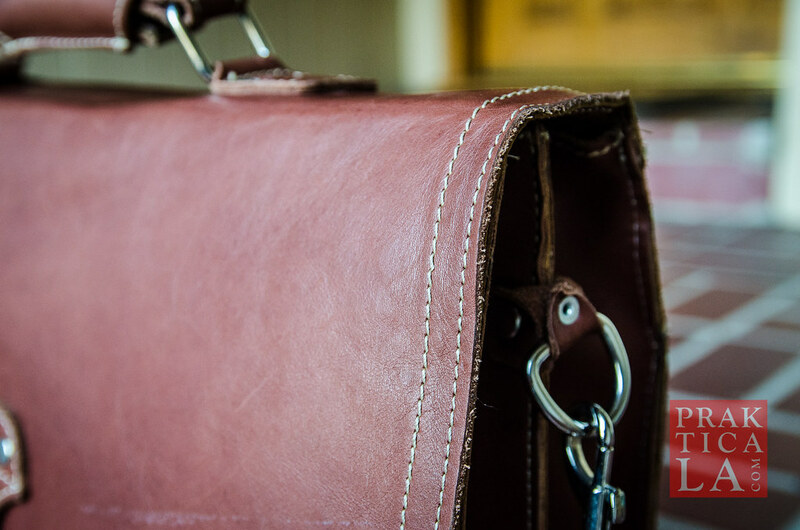 One trade-off for the flexibility of the leather is the lack of rigidity – the briefcase can be too floppy at times. Even though there are D-rings on the bottom to assist the briefcase in standing, I still have trouble keeping it upright, particularly if it contains a laptop or heavy books. I usually prop it up against a desk or chair, which is a minor annoyance. Future models might benefit from either a more rigid base and/or a less top-heavy design. 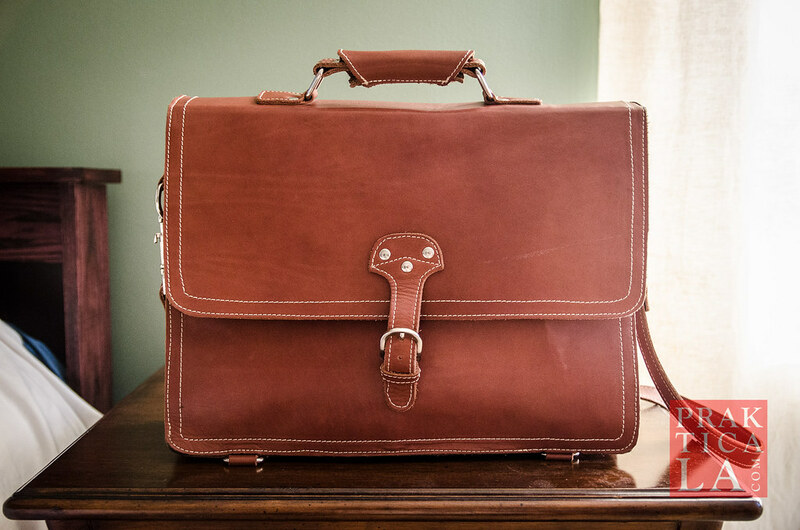 If simplicity is your thing, you’ll like the Garein briefcase. 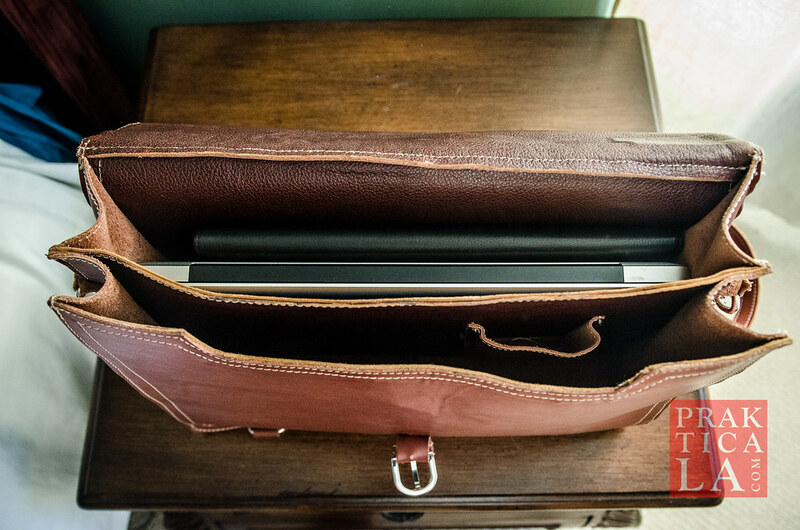 In an age of increasingly complex bags and backpacks (cell phone pockets, headphone cable ports, pen/pencil holders, business card sleeves, etc), the Garein briefcase is pleasantly stripped down. The two main compartments are of roughly equal size, suitable for storing books, documents, or a laptop. Besides that, there’s just one small interior pocket for your writing instruments and one exterior flap pocket for quick storage. The main flap is secured with a single belt-style buckle with three hole settings. Old-school, but it works. The style of the briefcase is fittingly utilitarian. 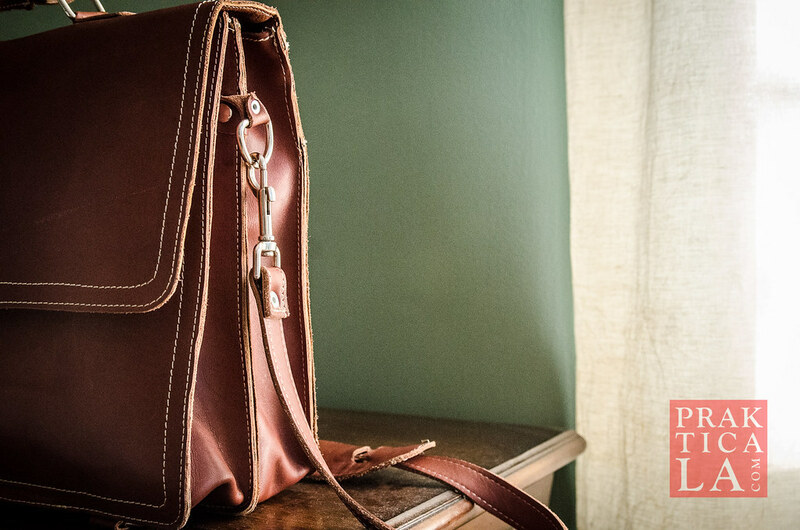 Big, broad pieces of unbroken leather, simple double stitching, brass hardware… and that’s about it. No other materials are present as far as I can tell. I appreciate how John Doe Shoes didn’t resort to cheaper plastics and fabrics, even for “unimportant” parts. 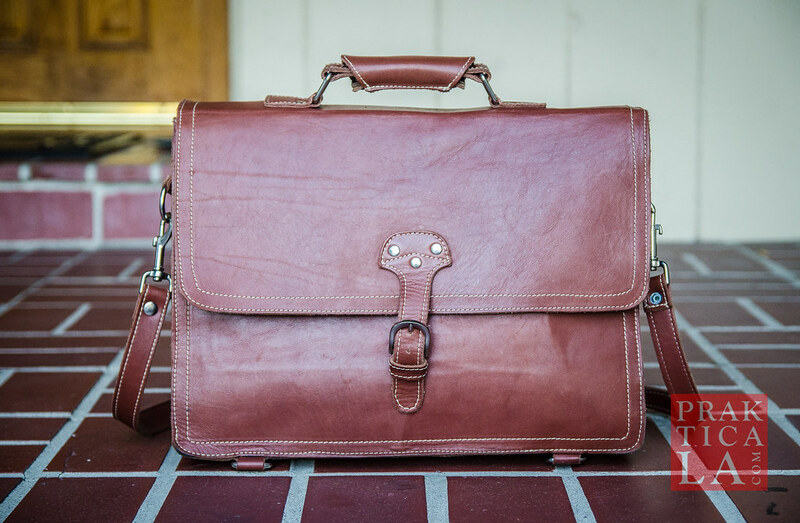 The straps, shoulder pad, and handle are all made from the same leather as the rest of the briefcase. 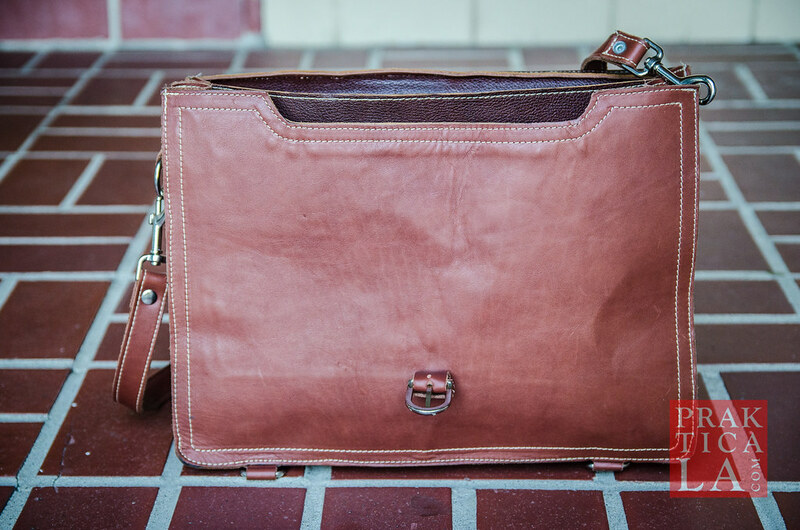 The full-grain texture gives it a rich, matte patina, in contrast with the cold, plastic sheen of past cheap briefcases. Note the markings and imperfections in the leather – things you won’t find on crappy, corrected-grain leather. PROS: Full-grain leather, attractive and heavy-duty. Simple, timeless design. Only three materials (!) observed – leather, thread (stitching), and brass. 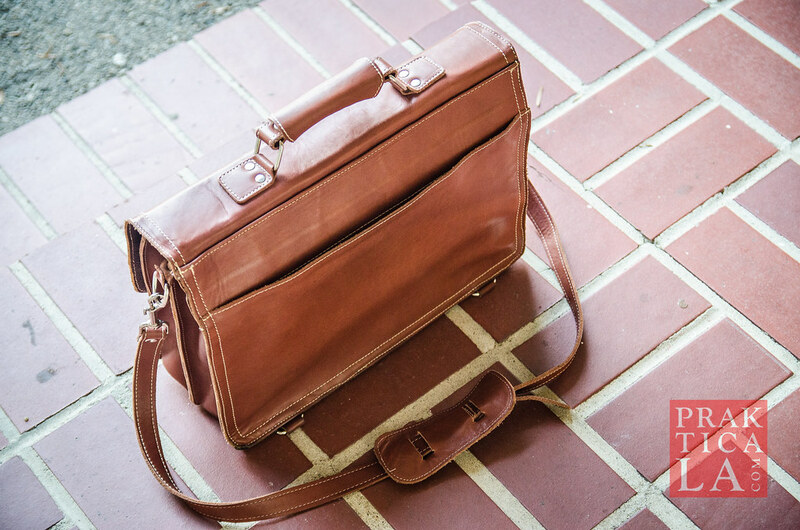 CONS: Lacks rigidity – the briefcase is hard to stand up on its own. John Doe Shoes is now two for two, having exceeded my expectations with both their shoes and briefcases. 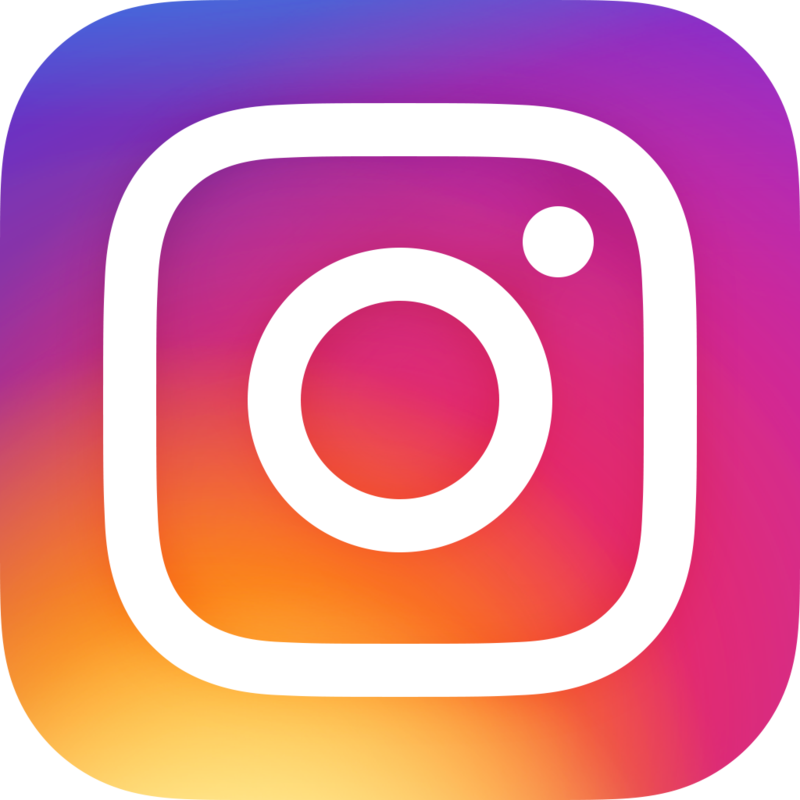 Don’t let their unassuming website and modest social media presence deter you. The products I’ve seen feature high-quality materials and construction, and you get a lot for your money. The company also recently informed me that they will have a new leather jacket coming out soon, so hopefully I’ll be able to grab one of those for review as well! Unfortunately, the Garein briefcase is no longer available at the moment (as of October 2016), but since John Doe Shoes appears to have a steady flow of new products, I expect to see another briefcase pop up again in the future. In the meantime, you can check out the rest of their entire product line here. For our review of the Whisky Box Calf Bonucci Oxfords, click here. Have any personal experience or feedback from John Doe Shoes? We’d like to hear your comments below!